Yesterday marked one hundred years since the start of World War One. Billed as the war to end all wars, it has unfortunately not lived up to that slogan. Looking at the media today you can often be confused for thinking that WW1 was fought for freedom and not the clash of imperial expansion. 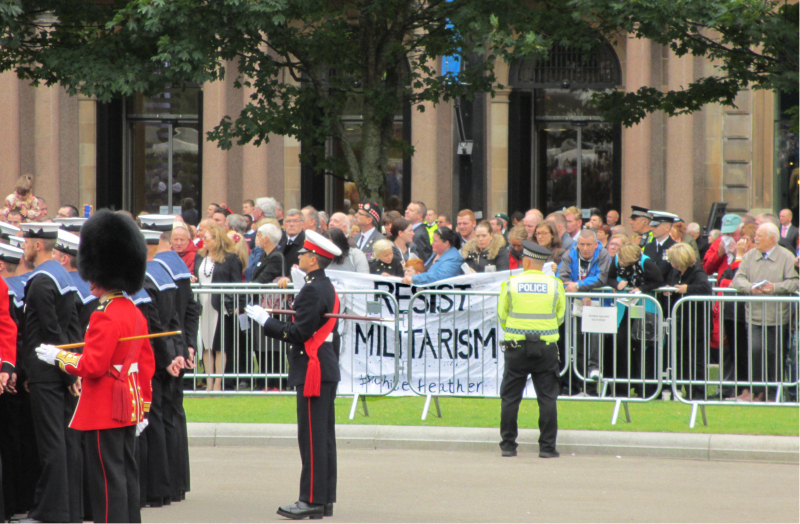 The government planned ceremony at Glasgow Cathedral and wreath-laying on George Square was a surreal celebration of war, the monarchy and nationalism, led the royals and government officials who benefit from wars today and think nothing of sending people out to die to extend their power and wealth. These grotesque celebrations did not pass without comment. The Scottish Peace Network had people from all different groups distributing information with the truth about conditions in WW1 and in war throughout the city centre. Some of us put up banners opposite the ceremony at the cathedral before heading along to the celebrations on George Square, however there was a disturbing amount of unnecessary cooperation with the police, leaving the Peace Network poorly positioned and often talking with cops rather than with other passers by. Those involved with the Peace Network activity soon moved to George Square, where a full military parade was due to take place. 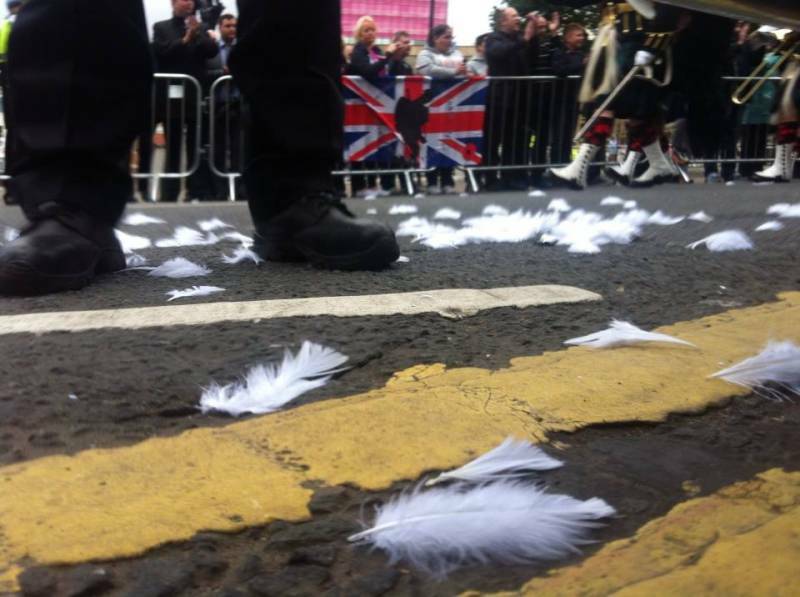 They were joined opposite by members of the White Feather Collective who were able to unfurl their banner as Prince Charles entered the square and spread white feathers in front on the parade in remembrance of those who were accused of cowardice for refusing to fight. 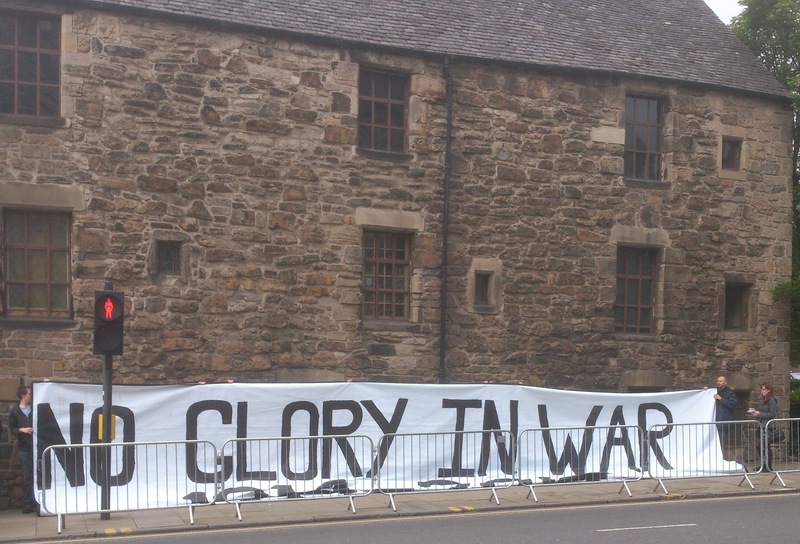 On the other side the huge banner brought along by folks from Faslane Peace Camp was held aloft. At one point builders lent scaffolding and wooden beams to hold it up, however the police bullied them into taking it back. The real solidarity was totally appreciated. 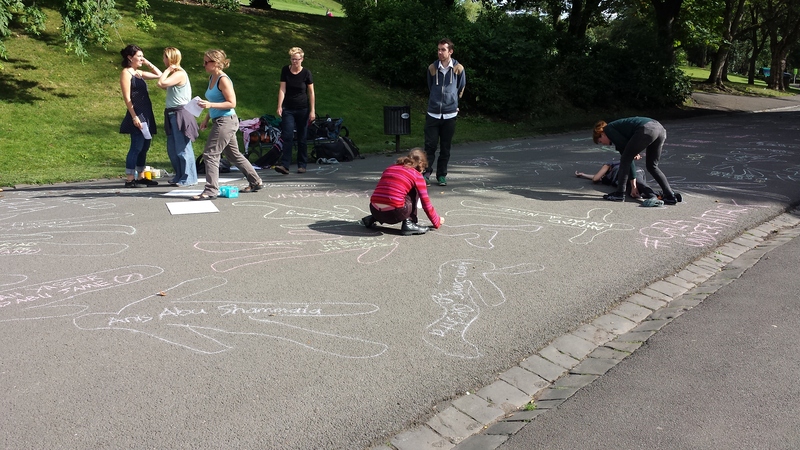 Once the feathers had settled there was time to regroup, hand out copies of the Anarchist Federation’s Against War in town, then at 2pm off to Kelvingrove Park where the White Feather Collective had arranged an event where we chalked out the outlines of the 1,500 people who had been killed in Gaza over the previous 26 days. 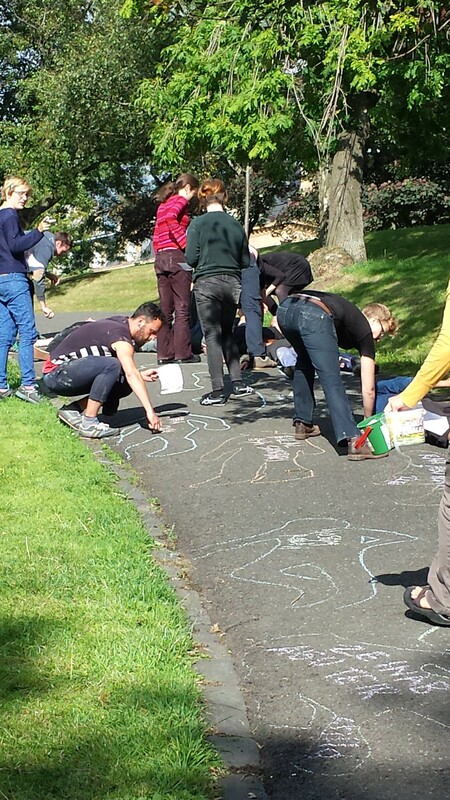 At one point over sixty people were working on drawing outlines, writing names and talking with passers by (many of which stopped to help). 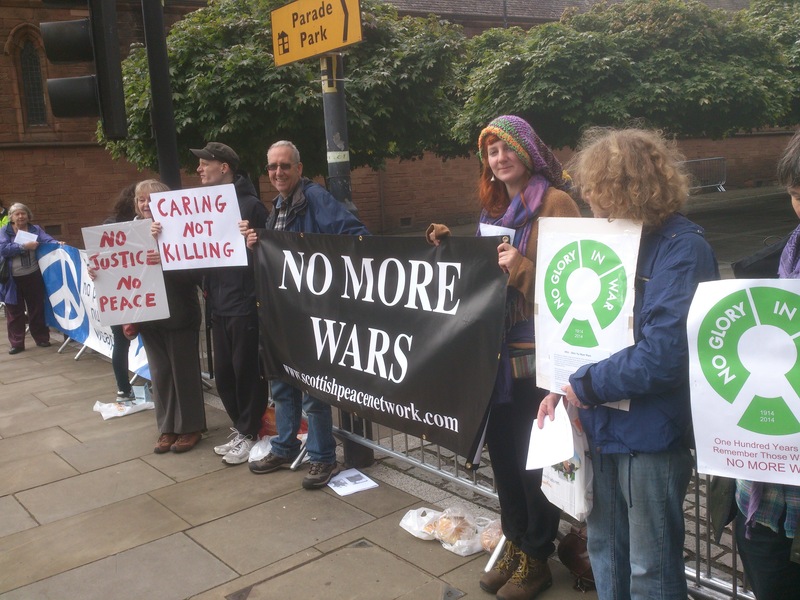 The overwhelming majority of people passing through were supportive of both of the anti-military message that there is no glory to be found in war and also the need to raise awareness and take action in aid of those suffering in Gaza. 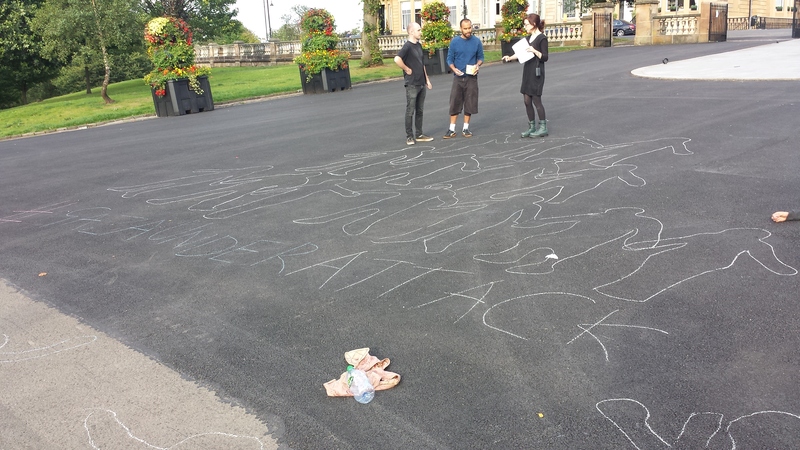 By 7pm the trail reached from the fountain up to the war memorial and all those who we had listed were represented. Some of us walked back along the trail with a banner; we got lots of support doing this and one group of people even stopped and clapped. 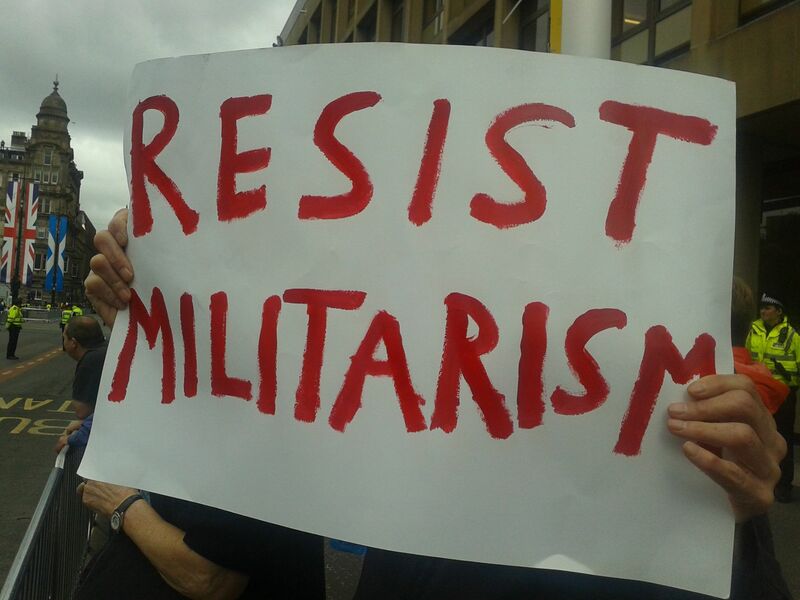 All told the day brought together many of the groups opposed to militarism in Glasgow and we demonstrated how we can all compliment one another’s strengths and cover each others weaknesses, while at the same time building awareness and public support for an anti-military message. Sorry about the slightly later than usual post this week, however many of the Glasgow AF team were off camping out at Talamh House and so have not had any internet action. Talamh is run as a housing co-op and is currently looking for new members to join them. If you are interested take a look at http://www.talamh.org.uk/ and get in touch. Two events over the next week really stand out as being highlights. Saturday sees a demonstration of all those in Glasgow able to come out and not only show support for the people of Gaza but to also make specific demands of the council to reflect the solidarity of the city. Then on Tuesday the government hopes to use Glasgow and the Commonwealth Games as a springboard to launch their commemorations of WW1, painting it in a light which glorifies militarism and war. 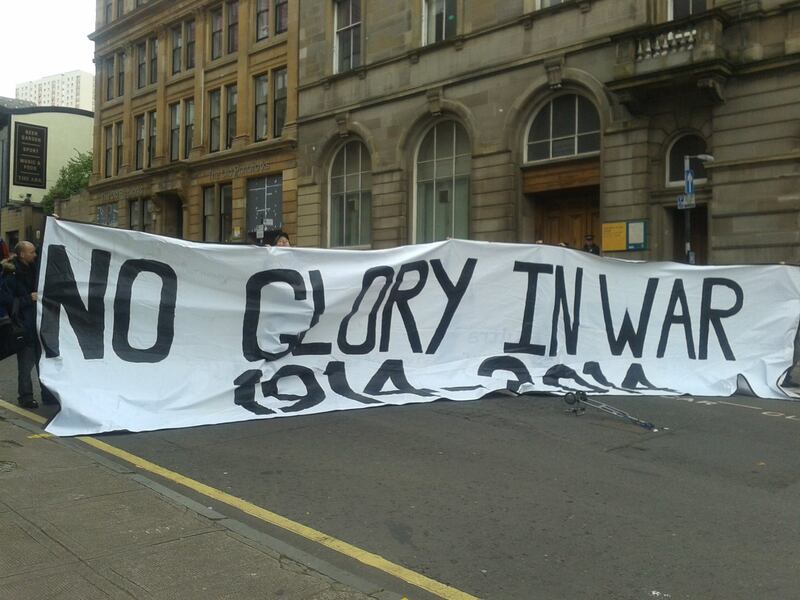 Glasgow was a hotbed of anti-militarism at the time, with working class people from up and down the Clyde being forced to bear the horrific cost of war. As sanctions and cuts hit we are seeing the same thing happen today. Let’s show that the cost of war has not been forgotten and that Glasgow roundly rejects the push further and further into barbarism. Stop the Slaughter of Gaza! Glasgow for Gaza Demonstration. Freedom for Palestine! More than 1200 Palestinians have been killed and over 7000 wounded as Israel continues to intensify the brutal onslaught against Gaza. Israel is acting with complete impunity and accelerating its murder of Palestinians locked inside the world’s largest open air prison of Gaza we must mobilise and demonstrate in our maximum possible numbers. Overnight Israel targeted another UN school killing 15 Palestinians seeking shelter there. The previous day Israeli tanks shelled fuel storage tanks and set Gaza’s only power station on fire plunging Gaza into a hellish darkness. 4. Glasgow has been twinned with Bethlehem since 2007, but people could be forgiven for not knowing that. We need that to be proudly publicised on all road signs around the border of Glasgow, at Glasgow City Chambers, in the People’s Palace, in George Square, etc. 5. 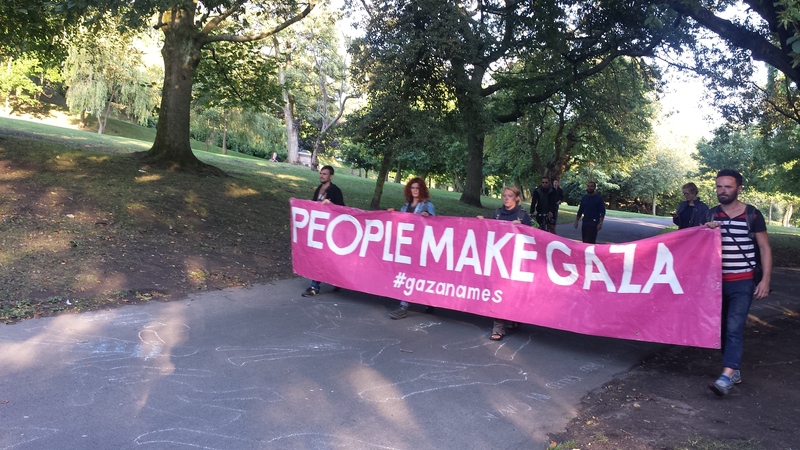 We call on all Glasgow Councillors to a photo opportunity at the demo to show their support for Palestine and for an end to Israel’s War on Gaza. Please email (so you get a written reply) to invite you local councillors to attend this photo op for Palestine! *We plan to join hands and completely surround Glasgow City Chambers to send them a clear, strong message… We expect Glasgow start living up to its proud history of being the first city in the world to honour Nelson Mandela and support the struggle against apartheid in South Africa. It is (long past due) time to do the same for Palestine. Stop the War on Gaza! Freedom for Palestine! Sponsored by the Gaza Emergency Coordinating Committee… Scottish Friends of Palestine, Scottish Palestine Solidarity Campaign, Stop the War Coalition Scotland, Scottish Jews for a Just Peace, Glasgow Palestine Human Rights Campaign, Ahl al Bayt Society, Friends of Al Aqsa, Muslim Council of Scotland, Muslim Association of Britain (Scotland), Federation of Islamic Student Associations and more supporters of Palestine. Playful Movement in nature: discovering self and place. Facilitated by Satya Dunning, Wellbeing Practitioner and Dance Artist as part of The Living Well series for Urban Roots. Half a day on Sunday 3 August 2014 at Malls Mire. 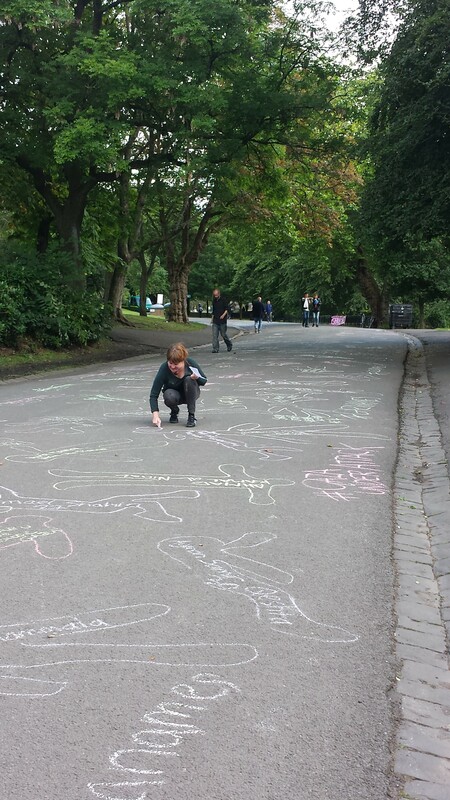 Playful Movement in nature aims to increase wellbeing by being creative in a natural environment. It’s a chance for you to get energised, and absorbed in a natural environment and leave busy thoughts and concerns behind. It’s a space to reconnect with your body, others and your surroundings through play, movement, mindful based activity, using your imagination and paying attention to what’s around you. Discover a new sense of self and relate to your surrounding creatively. Increase your capacity to be in the present moment and have fun. Improve your listening skills use a multisensory approach. Deepen your experience of how creativity and nature contribute to your wellbeing. 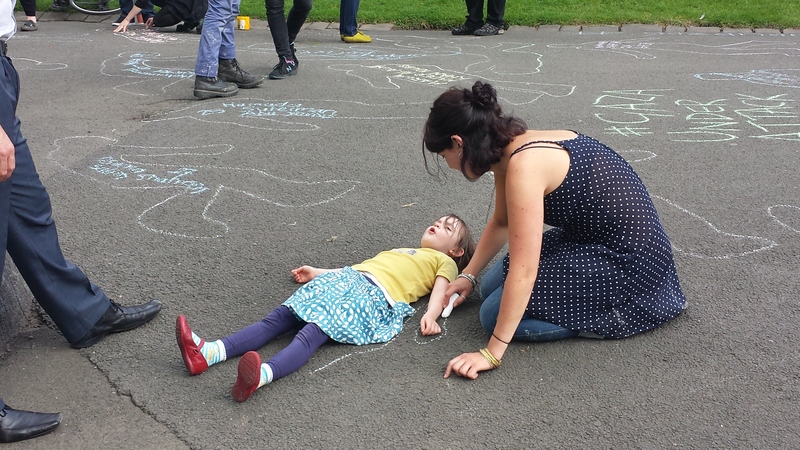 The session is usually a mixture of talking, playful movement, sometimes drawing, reflecting and seeing how we can bring these experiences into our daily life. No experience is needed. Open to 16 years old and plus. Water, a snack and something to write on (notebook, journal). 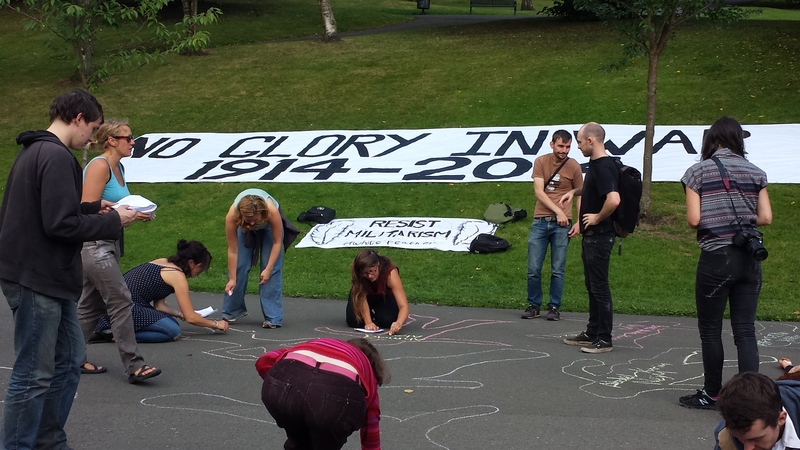 Calling for an end to all wars as the government holds its first Commemoration of the First World War. All welcome. Groups will be going out from Buchanan Street to various points in the City Centre to distribute leaflets. Some of us will be at the Statue until 10:30am. While honouring the memory of those who died we will remember the terrible loss of life and refuse to glorify the war. We will remember that Generals sent millions of men to be mown down by machine guns and that imperial rivals sought to gain interests, vying for colonial territories in Africa, the Middle East and Asia. We will also remember those who resisted the war: those who filled public squares in Glasgow and London; conscientious objectors who refused to participate in the slaughter and were imprisoned; trade unionists who organised on the Clyde; John Maclean, jailed for condemning the war as a bloody struggle of imperialist rivals; and women such as Crystal MacMillan who campaigned for peace throughout the war. Please tell your friends and workmates about this important chance to mark the horror and carnage of the first world war. Join KPC for a day of free family activities celebrating KPC’s summer youth programme on Saturday 9th August. The day will also showcase NicoleO’Donnell Performingartsacademy and the KPC Kid’s Summer Programme’s, ‘Carnival of Beasts’ parading at 3pm in Plantation Park across from KPC. The KPC Women’s Group will be cooking up tasty Indian foods and the KPC Kids will be serving homemade sweet treats in association with Open Jar Collective. Live music and more to be announced! Geoengineering research is at present a speculative venture at the intersection of Engineering Science, Climate Science and public policy. Current research programmes aim to devise and develop processes through which the climate could be actively tuned to partly offset the potentially regressive impacts of future human-driven climate change. For some, geoengineering is a clear example of human hubris, and, for others, a hedge against high climate sensitivity and/or the continued growth of carbon emissions. In this talk, Colin will explore the technological means of delivering geoengineering interventions, both feasible and speculative, and will put contemporary thinking on the topic into its historical context. He will then speculate on how large-scale engineering ventures could impact human development into the deep future – whether greening deserts or greening Mars, or indeed protecting the Earth from the natural calamities of the past. Colin McInnes is Professor of Engineering Science at the University of Strathclyde where leads the Advanced Space Concepts Laboratory, an awarding-winning space technology research centre. He is a Fellow of the Royal Academy of Engineering and the Royal Society of Edinburgh, and was awarded the Society’s Kelvin Prize in 2013. He is author and co-author of a number of publications on the technological challenges associated with Geoengineering, most recently contributing to an edited volume Geoengineering the Climate System published by the Royal Society of Chemistry. Join Glasgow Anarchist Collective, and let job centre plus staff know that we won’t be sanctioned, bullied or intimidated by the DWP. 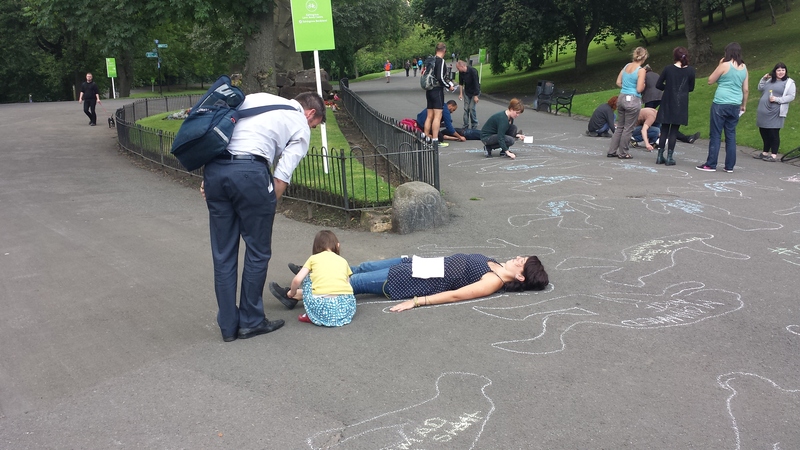 980,000 sanctions given out in Scotland – enough is enough! Dr Martin Poulter first encountered skepticism while a teenager. He has a Philosophy and Psychology degree from Oxford University and a PhD in Philosophy of Science from the University of Bristol. He has been a Scientology-watcher since 1995, when he was threatened with legal action over material he posted online. He is an ordained minister in the Church of the SubGenius, which offers eternal spiritual salvation or triple your money back. Martin spoke at one of Glasgow Skeptics’ first events, back in January 2010. As we approach our fifth birthday in November, we hope to bring back some of the best speakers we’ve heard from in that time. Glasgow Social Centre collective was a group that aimed to create a safe and healthy space, open to all members of the community, that was to operate as a hub for a variety of community and social groups in Glasgow. They worked on principles of mutual aid, solidarity and co-operation, and aimed to provide a space which promoted education and involvement in issues of environmental and social justice. Due to changes in life circumstances the original collective had disbanded over a year ago, however some of it’s members are still at hand and the idea of opening a sustainable social centre lives on. Individuals and groups are invited to this open meeting to discuss the formation of a new GSC collective. Cohousing is a way of living in community. Starting with an interested group of 20 to 25 households, we will design our homes for our site, including a common house where we will have regular shared meals and space for community activities, and visitor accommodation. The landscaping will enable more day to day interactions to develop the sense of belonging. Sharing the design process will be part of community formation. Once built we will each buy our homes, and pay a regular charge for the shared facilities, and do a few hours of work to maintain the facilities each week. We plan to use high building standards, reducing the need for energy input, and generating electricity eg from solar cells. Design will take into account the anticipated needs of an ageing community, like step free access. Plans are to have a cross age community that is mutually supportive, with opportunities to engage in activities, and reducing the isolation currently prevalent among older people. We are looking for a site with good access to public transport as the Cohousing Community will be part of the wider community that it is located in, not a gated estate. Capitalism is a Health Hazard! Hierarchy harms our health. Inequality in income and lack of control over living and working conditions leads to deadly chronic stress. Climate and environmental destruction is a major threat to public health. And that’s before we get to consumerism and the isolation of the individual; the emptiness of modern existence. While heathcare and modern sanitation are vital to achieve a base level of health, it will require a fundamental transformation of our society to tackle the big killers today and bring about well-being for all. What would this healthy society look like? This Fail Better is dedicated to the martyrs of Palestine (Gaza, West Bank & Historic Palestine). By answering the call from the Palestinian civilian population for the total Boycott Divestment and Sanction of Israel, we can work to dismantle the Apartheid State. If anyone has words or music to share, please get in touch. 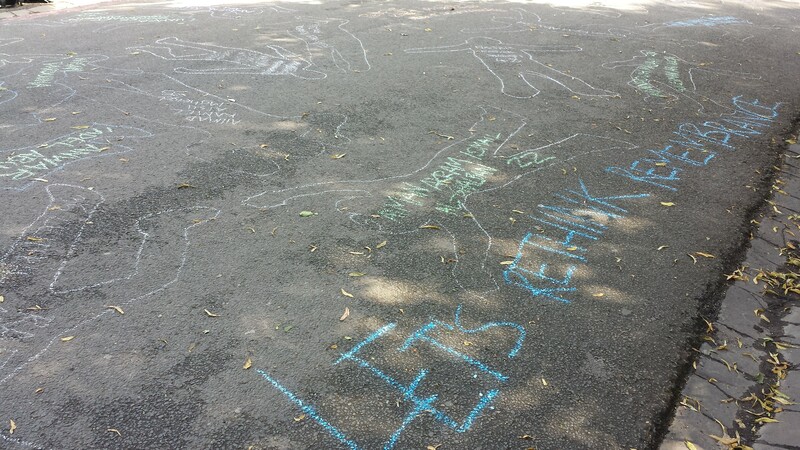 This Fail Better is a social space for discussing where we are. There will be no formal discussion, but treat the night as place to meet up with friends and folk to discuss what’s going on – whatever your knowledge/involvement with the Palestinian struggle. There will be as much information on BDS as we can get our hands on. In the late 1980s and early 1990s, criminologists warned a despairing and frightened public throughout the developed world that already terrifying rates of violent crime would continue to rise. They described, among other things, the emergence of the ‘Superpredator’, an adolescent male who knew neither conscience nor remorse. However, their predictions were wrong. Crime rates began to drop like a stone. In the US, the drop had already commenced when criminologists were sounding their direst warnings. Other developed countries – including both England and Scotland – followed the US lead, and crime is now at historic lows. Those who have read Steven Pinker’s ‘The Better Angels of Our Nature’ would be aware that Western societies have become less violent over the long term – as in, since the Middle Ages. The period from 1965 to 1990 – when crime rose – represented a short-lived and partial reversal of this trend. Because criminologists got it so wrong, many have reoriented their scholarship in an attempt to work out just what it was that made crime escalate in the 1960s, and then, as though by magic, drop away in the 1990s. Helen will discuss the various theories put forward in an attempt to explain the latest decline of violence, and offer suggestions as to which have the greatest explanatory power. Helen Dale studied her English law at Oxford (where she was at Brasenose) and her Scots law at Edinburgh, and although she now works in corporate law, she started out – for the most part – practising criminal law. One of her advanced papers at Oxford was in criminology, and she (like lots of other lawyers) wanted to work out how an entire discipline could get it so wrong, and what may explain the (recent) decline of violence.